I spoke to some (very) conservative investment bankers yesterday on some deals we are handling and asked about the debt ceiling as an aside. They were very concerned about the ceiling and seemed very favorable to McConnell’s offer. Europe is really, really spooking the investment community. Thus, they would like to tamp down the uncertainty here in the hopes that some sense of normalization here will help the sanity over there and otherwise across the board. 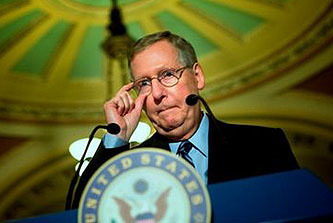 They said it was common knowledge that McConnell was taking very serious back-channel heat from Wall Street because the conclusion was that there was no reliable leadership in the House with Boehner unable to control his caucus and Cantor making his leadership play now. They view Boehner as out. In other words, McConnell is Wall Street’s only viable player and so he is taking all the calls. And those calls are not saying to insist upon cuts only come hell or high water. They are saying raise the F-Ing ceiling NOW. Have no idea if this was true. It’s in their interests to say all is well because the players in their deals want that to be the case, so who knows. I think the issue to watch is how commentators who came out against McConnell’s plan more toward begrudging agreement on the theory that there is an unreasonable authoritarian socialist in the WH and, contrary to said President who seems happy to send the country into default and cut off entitlements, they’ll be the responsible party, take their lumps and move on. For the good of the country. This sounds sort of plausible to me, but your mileage may vary. In any case, the final paragraph of this email amused me because I noticed the same thing yesterday, and it’s a testament to the efficiency of the conservative messaging machine. Literally within a few hours, I swear that every single conservative politician and pundit had adopted the line that talks had broken down because it was just impossible to negotiate with a socialist thug who was obviously dealing in bad faith. (The “bad faith” in question, of course, was Obama’s continuing insistence that modest revenue increases be part of any deal.) The speed with which this talking point made the rounds was truly impressive.